One more match to take to watch in 2015 and one that promises to be as entertaining as any of the matches that have featured on the Supporting Women's Football Blog over the past 12 months, not often I go to watch a match in the FAWPL Southern Division, this fixture being the 1st of this season, as newly promoted C&K Basildon Ladies take on defending champions Portsmouth FC Ladies. C&K Basildon Ladies won the FAWPL South East Division One title last season to earn a place in the FAWPL Southern Division, the top tier of the winter women's football pyramid. The Essex side have risen rapidly through the women's football pyramid from Essex County Division Two runners-up in the 2007/08 season, through the Eastern Regional Leagues into the FAWPL, where they have had a solid start to life in the Southern Division. Helped by a great start winning their opening 2 league matches whilst beating Coventry United Ladies in the FAWPL Cup Preliminary Round. Was followed by a poor spell in September where they failed to collect any points. Since then thing's have picked up have gotten points on the board are in 7th spot in the table on 16 points going into today's match. 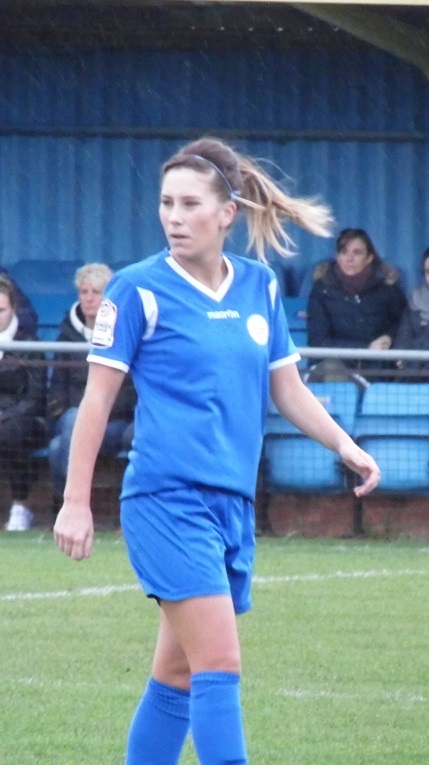 The points have coincided with the squad being bolstered by a few new faces coming in as the club capitalised on the dispute at local rivals West Ham United Ladies to bring in and offer football to players that were supposedly surplus to requirement, such as their former captain Stacey Little and vice-captain Kerry Stimson along with Lily Mellors and Kayleigh Xidhas. 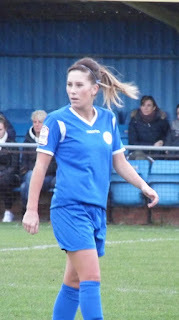 Katherine Huggins is another new face coming in from London Bees. Had brought in experienced goalkeeper, Cherie Rowlands at the start of the season, however she under went knee surgery this week and will be unavailable for 2 to 3 months. Portsmouth FC Ladies are the FAWPL Southern Division champions, winning a very competitive title campaign last season. Are currently 4th in the table and are amongst the favourites again, with Brighton & Hove Albion WFC leading the way, both Charlton Athletic Women and Cardiff City Ladies in 2nd and 3rd respectfully will fancy their chances too, along with Coventry United Ladies in 5th who rejoin the Southern Division after a year away competing in the Northern Division. Another competitive season is unfolding at the top. Not only is the title up for grabs but the league winners will face their Northern Division counterparts in a one off play-off game the prize a place in the FAWSL. 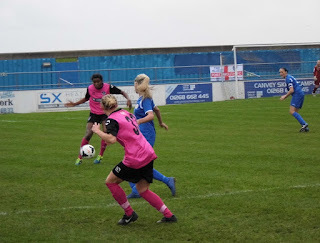 Portsmouth FC Ladies were so close to achieving that back in May this year only to lose out to a last minute goal scored by Lisa Giampalma to give the prize to Sheffield FC Ladies. 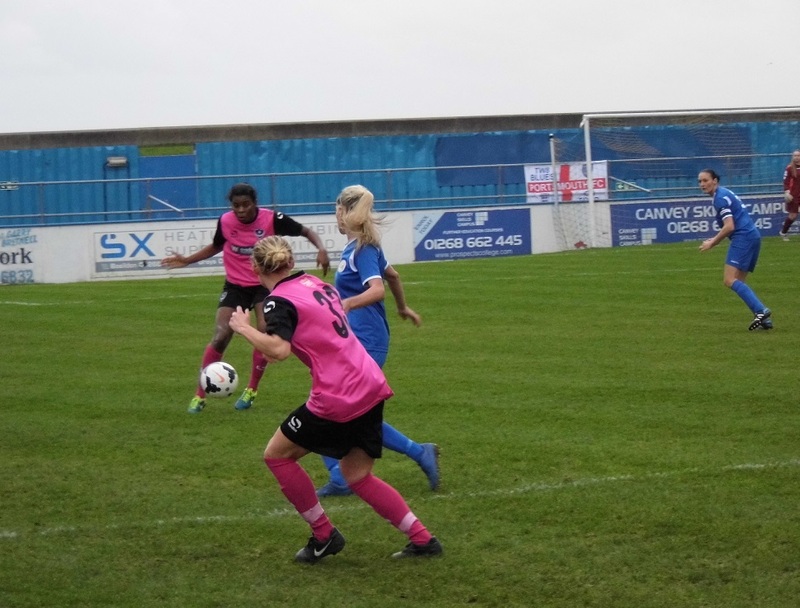 Portsmouth FC Ladies have had a solid start to their 2015/16 campaign winning 9 of their 14 matches played so far. Haven't had the momentum fixture wise to get them up amongst the top three, a win today could see them claim 3rd spot going into the Christmas break, set them up for the New Year. Also have a former West Ham United player in their squad although Emma Sherwood wasn't available for today's match. C&K Basildon Ladies are playing their home matches at Canvey Island FC this season right beside the Thames Estuary and sits a few feet below sea level. An interesting non league ground full of character, the sat nav doesn't like it but it's well sign posted and easy enough to find. A large sized pitch with an array of covered seating and standing areas beside the pitch a large terrace behind one goal, clubhouse and refreshments. The weather's still remarkably good for the time of year was bright and sunny leaving Norfolk, clouds got darker driving into Essex was over cast and a few spots of rain in the air a brisk swirling wind blowing across the pitch as the two sides walked out to start the game. C&K Basildon Ladies starting XI - Molly Povey, Kerry Stimson, Claire Lacey (C), Hannah Porter, Karen Stephanou, Zoe Rushen, Stacey Little, Katherine Huggins, Lily Mellors, Amy Nash & Karissa Rodney. Portsmouth FC Ladies starting XI - Courtney Trodd, Tiffany Taylor, Leeta Rutherford, Paige Atkinson, Shannon Sievwright, Molly Clarke, Sarah Kempson, Gemma Hillier (C), Lucy Quinn, Katie George & Ini Umotong. subs - Natasha Stephens, Leah Samain, Charlotte Benson, Eilidh Currie & Katie James. It's Portsmouth in their away colours, pink shirts with black sleeves, black shorts and pink socks to kick off the match with Basildon lined up opposite in their all blue strip. The visitors lay the ball out to the right for wide player Lucy Quinn, she looks to play the ball forwards through the centre trying to pick out striker Katie George, attempts to header the ball forwards into the box for Ini Umatong to chase gets too much on it carries through to Molly Povey deputising in the Basildon goal. 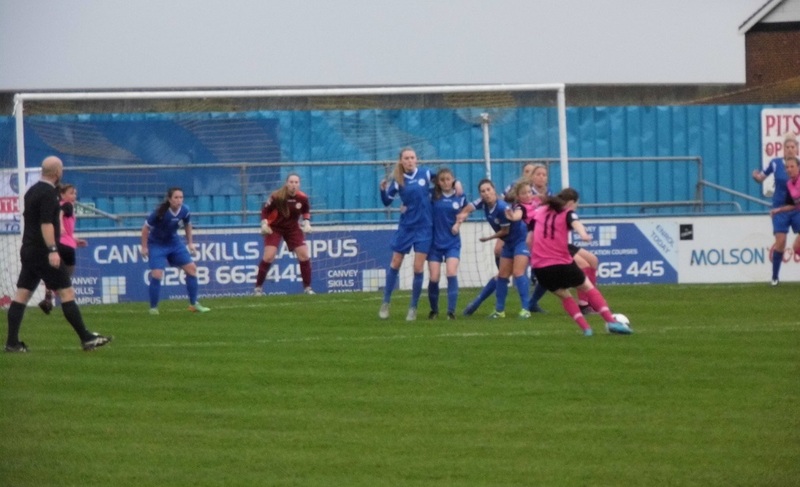 Courtney Trodd between the sticks for Portsmouth gets an early feel of the ball too as Basildon look to do the same from their 1st attack, playing it through the centre the ball from the middle too strong their attacking players to get onto. The midfield looks like it is going to be hotly contested as the battles shape up early on. Portsmouth get the ball into the feet on Umatong the Nigerian international striker drives forwards making a run across the face of the box plays the ball out to Quinn coming in from the right her 1st time shot is blocked Karen Stephanou taking the sting out of the shot rolls through to Povey. Stacey Little playing in the middle of the park for Basildon closes down well winning the ball from the Portsmouth defence 20 yards out takes on the shot, the ball is deflected through to Trodd who scooping it up sets up a quick counter attack as the ball is played through to George who catches the Basildon defence playing a high line racing in behind, hits the shot 25 yards out drills the ball low and wide across goal. GOAL! Basildon have been working hard to pressure Portsmouth on the ball at the start of the match make it difficult for their defence to play the ball out, Kerry Stimson comes racing forwards like a train from right back getting hold of the ball inside the Portsmouth half powers her way past two players before running towards the by line, sends her cross in along the six yard line, is just behind Karissa Rodney making a central run, but runs through perfectly for Amy Nash arriving at the far post to meet the ball and turn it home under the diving keeper 1-0. 10 minutes played. The rain has started to fall again the wind picking up a little Portsmouth build a counter attack up the left, Shannon Sievwright playing the pass into the feet of Umatong her back to goal 35 yards out she turns inside looks to drive towards the box is brought down in a dangerous position right in front of the D. Quinn is the player over the free kick, gets her shot through the wall, Povey sees it and gets down quickly to make the save. Portsmouth's Sarah Kempson switches play from left to right with a great cross-field pass to pick out Quinn out wide on the wing, pushing up the pitch sends her cross in along the face of the box looking for Umatong her 1st touch is too heavy takes the ball away from her, has Molly Clarke making a run from midfield to get up in support edge of the box right of the D hits the shot is blocked at point blank range. Continuing to press the Portsmouth back line Basildon are causing some frustration amongst the visitors with Little, along with Zoe Rushen and Katherine Huggins looking to win the ball high up the pitch this time it's Huggins who gets a shot away as she goes up to challenge for the ball 20 yards out the shot getting through running wide of goal. Gemma Hillier the Portsmouth captain is fouled brought down inside the Basildon half the set-piece wide left is played long into the box, Basildon's Hannah Porter rises highest to get her head on the ball, another foul is given away in the same position as Basildon look to break, again Porter deals with the high ball sent into the area. Portsmouth get another free kick in a better position on the right side in front of the box, Quinn takes on the shot smashes the ball into the Basildon wall the rebound coming back to her gets a 2nd attempt to shot sends her effort wide across the face of goal. Sievwright bringing the ball up from the back on the left fires it into the feet of Umatong back to goal 30 yards out turns inside and looks to drive with the ball before trying to pick out Quinn making a move into the area from the right, instead Porter gets back to make the interception heads the ball out to the left, Portsmouth regain possession the cross is fired in towards the near post, Quinn racing in almost gets something on the ball as keeper and defender can't clear but the ball is out of play. Quinn does well on the right covering plenty of yards with the ball at her feet before squaring the cross in towards the near post for Umatong to attack with her head, knocks it down into the ground but straight at Povey well placed to make a comfortable save. Portsmouth are getting some momentum as the half draws to a close Quinn in the right attacking again lays the ball inside for Clarke who lets it roll on through to Kempson in the centre is a good way out but given time to tee up the shot takes it on sends the ball over the crossbar. GOAL! Portsmouth press Basildon for the ball as they try to bring it out from the back, Clarke winning the tackle in the centre plays the ball over the home sides defenders with Umatong breaking free into the space beyond running centrally, Povey comes rushing out towards her, Umatong flicks the ball up and over the keeper leaving her stranded as she runs in behind to turn the bouncing ball into the back of the net 1-1. 40 minutes played Portsmouth are back on level terms, are almost caught out straight away as Basildon launch the ball over the top sending Rodney through into space on the right pushing into the box looks to send her cross along the six yard box with Nash sprinting to get in at the far post again this time though the Portsmouth defence gets back and Leeta Rutherford gets control of the ball. GOAL! Having only just pulled the scores level the visitors take the lead 2 minutes later. The ball is played out quickly from the back put out to the right Portsmouth's George takes it up the wing before sweeping the cross in towards the near post with Umatong coming to meet the ball throws herself at it sending a bullet of a header past the keeper and in 2-1. GOAL! The Portsmouth bench warns their players not to get caught out from the restart however they concede in the simplest of manners the ball is won back by Basildon in the centre and chipped over the Portsmouth defence, Rodney races through the centre to get after it, Trodd comes racing out to meet her, Rodney lobs the ball over her and it drops over the line into the goal 2-2. A thrilling end to the 1st half with 3 goals scored in as many minutes Portsmouth coming from behind to take a 2-1 lead only to concede straight away to leave it al square at half-time. A entertaining an competitive contest, Basildon's hard work in closing Portsmouth down at the back paying off and frustration the visitors, not helped with a few referring decisions going against them. Portsmouth getting joy down the flanks especially the right through Quinn, Umatong strong on the ball scoring both their goals. All set up for an exciting 2nd half with the wind having died down. Basildon get the 2nd 45 underway. Put the ball forwards from the kick off, Portsmouth head it back out into the middle, drops to Rushen, decides to take an early pop at goal sends her strike wide of the mark. Basildon are then awarded a free kick on half way wide on the right a good deliver in towards the edge of the area captain Claire Lacey up from the back heads the ball on looking for defensive partner Porter behind her, a pink shirt gets there 1st the ball dropping loose a shot comes in lacking any power Trodd is able to scoop it up into her gloves in the Portsmouth goal. Both sides are conceding free kicks this time Porter with the foul on George wide right. Kempson to deliver the ball into the area is headed away to the right by Little back to defend, Kempson retrieves the ball sends the cross/shot in towards the near post Povey is across to make the save. A high tempo start to the 2nd half pressing forwards down the right Quinn cuts back inside looks to stab the ball past Porter as she enters the area, Porter snubs it out rolls back to Quinn hits it hard this time, Porter blocks the ball spinning out wide left comes to Clarke who smashes her shot wide. Povey gets hurt going down to save a long ball put into the box for Umatong to chase down lunges for the ball as Povey goes down to stop it no intent brave keeping the ball going out for a corner on the left Povey hopping gets up to defend her goal then saves well putting the ball behind for another come as it is sent in towards the near post. Basildon half clear the 2nd set-piece comes to the feet of Hillier 25 yards out central has a crack at goal drills her effort wide. GOAL! Basildon are awarded a penalty kick. Rodney having gotten hold of the ball out on the right, has got much support up with her, Nash is covering the grass racing across the area her run towards the near post, Rodney looks to pick her out, Nash gets in between a defender and Trodd going down to try and get hold of the ball, Nash goes over the keeper and the referee points to the spot. It's Rushen with the spot kick no messing sends it low and hard to the keepers right into the bottom corner to restore their lead 3-2. Portsmouth look to hit back straight away the ball played up into George she looks for a deft lay off to send it on into the path of Umatong as she looks to break into the box, Porter gets her toe to the ball pushing it out to the left, Hillier gets onto the ball 1st taking on the early shot blasts the ball behind the goal. Pressing hard the visitors come again the ball fizzed into Umatong, does well to bring it up hit on the turn blocked by the defenders inside the box runs back into Sievwright 25 yards out shoots a low effort Povey gets down low to make the save. A poor goal kick presents another opportunity for Portsmouth the ball played straight into Kempson, gives it to Umatong outside the box goes for goal over the bar, but not by much. Portsmouth continue to attack Umatong with a drive through the middle looks to play the ball into George just inside the box, is a strong challenge on her from Lacey the ball ball spinning out to the right of the area falls to Taylor, gets plenty behind the shot, Povey saves well getting her angles right. Hillier given the ball attacks down the right gets past her marker before sending the cross in for Umatong to attack near post, Povey knocks it down, and a Umatong tries to control it a handball is spotted the free kick going against her. GOAL! The pressure pays off pushing hard to get back into the match Portsmouth bring it level again the ball put forwards into Quinn on the right outside the area looks to go for goal a high curling effort that goes over Povey and dips under the bar, a quality strike to make it 3-3 with a little under 20 minutes to play. Very nearly have the lead again a minute later but for a brilliant save from Povey. Kempson the ball at her feet in the middle powers her way forwards into the Basildon half before unleashing a shot 30 yards out, got the perfect view of this one and rising it's on target destined to fly under the bar, Povey stretching throws a glove up and getting her fingertips to the ball turns it over instead for a corner kick. Double change for Basildon as the match enters the last 15, Huggins and Mellors coming off to be replaced by Meagan Doyle and Rebecca Smith. The corer taken shorts is well defended. GOAL! The substitutes make an immediate impact as Basildon's midfield stops Portsmouth getting through the ball won by Rushen is put out to Doyle on the right side plays an early ball up into the middle with Rodney bursting clear of the Portsmouth defence again, getting the ball approaching the edge of the area Trodd has to come out try and close her down diving, Rodney gets her shot away sending it under her and it rolls oh so slowly over the line beyond 4-3 with a little over 10 minutes left to play. Winning a throw inside the Basildon half on the right Kempson demands the ball from the takers, gets it turns and shoots 25 yards out, a powerful blast, wide of the target. Portsmouth win another free kick as Porter goes in strong on Umatong right side outside the area. Kempson is over the ball looks to go for goal. Povey standing on her line is worried keeps her eye in it the ball drops late but onto the roof of the net. The game has gotten a little stretched, end to end passes are being rushed however and this is presenting both defences with the opportunity to win the ball and bring it out. Hillier has come inside to play through the centre late on the ball put into her inside the D, shows her skill with a clever back heel to send the ball on into the area no one there to capitalise. Late change for Portsmouth with Hillier the player coming off, Natasha Stephens the player coming on as the light is starting to fade the floodlights on. Late into the match one last chance for Quinn as she takes on the shot from a long way out, Povey sees it into her gloves. The final whistle blows and Basildon win the match 4-3 and consolidate 7th spot. Have a target of 20 points according to their program notes for the season and are now just 1 point away from achieving that. Worked hard today their closing down especially the midfield preventing the Portsmouth defence bringing it out, frustrated the visitors edging a 7 goal thriller, great game to watch for a neutral such as myself. 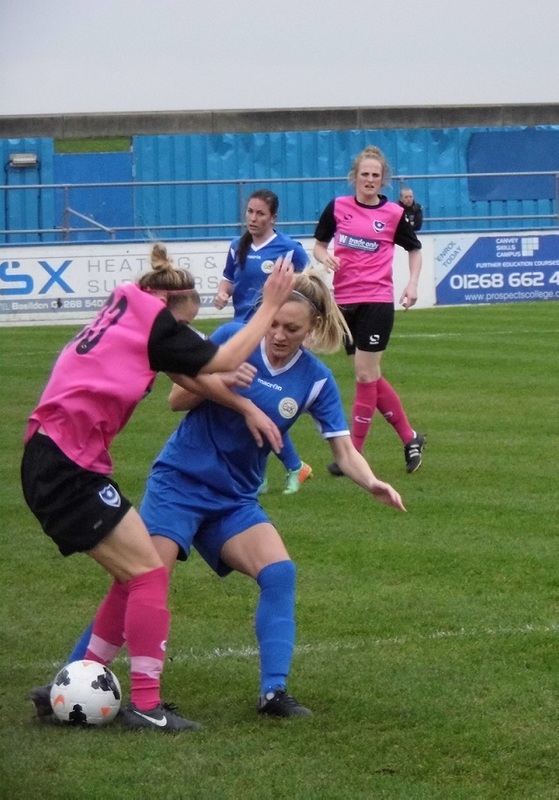 Portsmouth lose ground on leaders Brighton & Hove Albion WFC after today's defeat a frustrating afternoon, getting back into the match then conceding straight away pushed hard in the 2nd half to get back into it again and could very easily have been 4-3 winners themselves. My thanks to C&K Basildon's Peter King for helping me out with the team details today enjoyed my trip down to Canvey Island. My 90th women's football match of 2015 the last for the year have enjoyed every single one of them, looking forwards to even more entertainment in 2016, until then wishing you all a Very Happy Christmas. Great report Darren!You should of had a chat with Kat Huggins she's from Norfolk too!